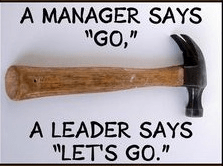 There is a difference between Leadership and Management and people use the words synonymously (which is wrong). But this will be a blog post for another day. Today’s focus is for those of you whom are in a Management position in Oil and Gas who are looking to increase productivity within your sales teams and bring out the best in the people you manage; sounds simple right? Ask yourself which one are you doing more, telling or showing? It will require some effort on your part to begin with. But you need to go out with each one of your sales reps and show them. Show them how the sale is made that day, how you interact with the customer, how you handle the objections and so on. Allowing your rep to watch you in action. Your outcome for being uncomfortable for a little while will be significant increase in your sales numbers, which is what you really want at the end of the day. Most importantly your reps will view you now with new respect based upon you showing instead of telling. And I am guessing that you would like that very much as well!